Release Date 30th January 2014 (PC), March 2014 (PS4). Living with other people can occasionally be a bit frustrating. Truth be told, it’s sometimes an experience that can leave you becoming a little paranoid, too. Do they leave crumbs in the butter? Do they drink milk from the carton? Are they secretly an octopus? These are questions some of us have to ask ourselves on a daily basis. I’m by no means the only person to do so either, as is evident with the latest release from Young Horses. Rather than put you inside the addled, psychotic mind of crumb-butter man or the dairy-carton drinker, they chose to make a game about the most interesting concept of the lot; what if you were really an octopus, and were forever trying to conceal your true identity? 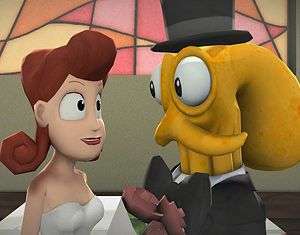 With that, a successful freeware title was born, allowing players to take control of the (many) limbs of Octodad: loving father, caring husband, secret octopus. Where other games saw you take on the role of a bald space marine with a tortured past and the annihilation of his foes for therapy, this one saw you attempt and bungle the simple and mundane tasks that comprise the life of a family man. Difficulty didn’t come from increasing waves of enemies, but the fact that you had tentacles instead of opposable thumbs. Tension came not from planetary destruction, but the fear that you might be made into sushi rolls. So when Young Horses took to Kickstarter to ask for backing for a sequel, it wasn’t surprising that it received more than it needed in funding. When it was presented as an example of Sony’s commitment to indies at last year’s E3, it promised to be one of the most unique experiences you could ever hope for. Few may have suspected it, but Octodad: Dadliest Catch is one of the best possible ways you could bring in a new year of gaming. The story begins when our hero stumbles (flops?) out of bed and begins his morning routine, only to discover that his wife intends to take them all on a trip to the aquarium. Despite his dissent (blubs?) to the contrary, he’s soon dragged (floundered?) 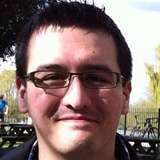 along and forced to keep his identity safe not just from his wife and kids, but from the outside world as well. Nobody said masquerading as an ordinary human being wasn’t easy, but both your problems and the true majesty of Octodad: Dadliest Catch begin with the control scheme. There are plenty of different methods with which to control our fauxmo-sapian, with the two most prominent being via the mouse and standard controller. In both cases you’re tasked with moving each individual limb separately, with the main differences being that the former forces you to swap between controlling the “arms” or the “legs” and the latter lets you move both at once. 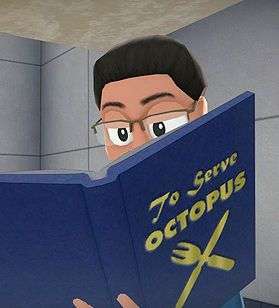 That information won’t really get you much further, as Octodad‘s world is one where knowing what you need to do and actually making it happen are two entirely separate things. It’s one thing to be told you need to make burgers for the kids, but it’s another thing entirely to grab the patties, put them on the grill, flip them and plonk them on your children’s plates without hilarious, hilarious disaster. Mastery will not be your end-goal here, and instead your main task will be coping with the deranged control scheme as best you can before journey’s end. It’s hard to talk about because, although it’s inherently difficult to get Octodad to do anything, that’s also the entire point and the main draw of why it’s all so much fun. If you could complete every task without floundering around, breaking everything in your midst, and barely avoiding total disaster, then it’d probably all be over in about twenty boring minutes. Instead, it’s one of the most charmingly mental and memorable experiences the indie scene has to offer. The opening chapter has a seamlessly inserted tutorial set on our hero’s wedding day, and expertly helps you begin to decipher the controls in a low-pressure environment before throwing you into the high-octane thrill-ride of fatherhood. What makes it such a compelling start isn’t just the way it eases you in, but it also aptly demonstrates that, while the end-goal is always straight-forward and linear, the path to getting there can be anything but. Sure, you can go straight to the cupboard and don your tuxedo, but you could also press that big red button, hit the dance-floor and see that delicious wedding cake crash to the ground tier by tier. You could make a beeline for the altar, or you can knock over the pillars, throw bananas at the attendees, plink away at the organ, and try to put a donut on your wife-to-be’s wedding finger. That’s not to say you can go too crazy though as, for the most part, Octodad‘s antics in the company of others are carefully constrained by the suspicion meter, which will start filling up when you act distinctively off-kilter. Knock over too many boxes, bump into too many people, or slip on too many banana skins and the meter will rise, only dropping when you manage to accomplish the herculean tasks you’re given. If the bar becomes completely full then everyone around you will realise that you’re an octopus, and you’ll be back at the nearest checkpoint before you can say “seafood”. There’s one for for whom the suspicion meter isn’t needed – Chef Fujimoto, a dangerously unhinged sushi chef, paranoid that sea creatures are about to wage war on all humankind. Worse still, he knows our hero’s true identity, believes him to be part of the invading forces and won’t stop until he’s been exposed and made into a moderately priced meal. As the primary antagonist, Chef’s appearances often descend into minor confrontations, temporarily altering the gameplay and giving you only a short amount of time to take action before death occurs. These moments flit between quick-thinking puzzles, frantic chases, and stealth sequences without feeling forced and keep the action both varied and unpredictable until its closing stages. The status of the sushi chef as the villain and the fact that everyone believes Octodad is human the moment he’s wearing clothes both tie into what shouldn’t be a startling discovery – that the writing isn’t exactly taking itself seriously. What will surprise you, however, is the fact that it’s not just a comedy, but it also knows how to manage more serious themes while the premise undercuts them thanks to the fact that the hero is an octopus. For example, the story of an increasingly estranged wife upset she’s losing her husband, being constantly kept out of the loop and unsure what’s being hidden from her – and why – has been done thousands of times before, yet few have portrayed it as elegantly as Young Horses despite that secret being that her husband is an octopus. There are some genuinely heart-warming moments as Octodad helps his daughter overcome her fear of the dark and monsters that completely overshadow anything made by David Cage in the name of emotions, even though her father is a goddamn oct- well, you get the idea. Dadliest Catch is still a comedy at heart, and there’s seldom a moment where a joke doesn’t land, but it still knows more about being human than most games out there. It knows when to pick and choose its moments; whenever it wants to be more serious the juxtaposition between the situation and the premise never jars in a way that undermines what it wants to achieve. However, when it does want to be funny, there are few titles out there that can reasonably top it. Even when the final act approaches and the focus is drawn away from comedy and towards tense action and player skill, it still knows how to throw in a perfectly timed joke as a reward. It may be sharply written and full-to-bursting with jokes, but Octodad‘s greatest comic achievement is giving you the tools to create your own comedy and letting you off the leash. Titles like Grand Theft Auto are well-revered and constantly feature in lists about the best games, but most of the anecdotes people have are when they strayed away from the story and were allowed to mess around in the world in a way they saw fit. In this regard, Dadliest Catch is much the same; some of my favourite moments and the times I found myself laughing most came from complete accidents or because I was trying to push the limits of what I could get away with. Why slip on a wedding ring when I can try to throw it on to her finger instead? Why scuttle down the aisle when I can flop over the pews and on top of the weddings guests instead? Why bother winning the crane game legitimately when I can crawl inside it and then get stuck trying to make my way out again? 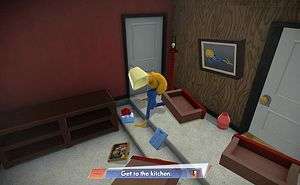 As in The Stanley Parable, every choice you could possibly make is accommodated for, but the true humour comes from discovering it all for yourself; it’s one of the few games I can think of where you’re rewarded for failing as much as you are succeeding. That feeling even extends to the many stealth sections scattered across the story. It may be billed as an action-adventure, but in actuality Dadliest Catch feels more like the funniest stealth game you’ve ever played. After all, you’re constantly trying not to get caught out as an octopus even before the sections where you’re attempting to stay hidden from the many marine biologists stationed around the aquarium. Normally, forced stealth sections are horrendous affairs where there’s only one path to take that you can only come across through trial-and-error or clairvoyance, while being seen even once sends you straight back to the beginning. Octodad manages to avoid that for the most part, or at least I never found myself suffering from those moments. Instead, it always felt like there was more than one correct way to tackle every situation and that I’d worked out one of several solutions, rather than the only way through. That does a lot to mitigate any potential frustration in the latter stages particularly, as you still feel encouraged to experiment and improvise rather than try the same thing over and over until it suddenly works for you. Even while goofing around, I managed to clock in just over two hours with Dadliest Catch, but that certainly didn’t mean that I’d seen everything it had to offer. Although you can easily call it a day once the credits have rolled, there’s plenty to keep calling you back to the land of Octodad. For one, there are the collectible ties that only unearth themselves to those fully willing to explore every nook and cranny they can – I only found about four in my first play-through, and that was only because I’d already played the wedding level to death at events before getting my hands on the final product. Then there are the achievements. I only managed to rack up three of thirty-two; two for story progression and one for plugging in a controller. The rest come from either completing challenges with a certain level of skill, finishing the story without dying, or by experimenting in ways you otherwise wouldn’t have thought of. It’s not possible to collect them all in one attempt, so completionists will find themselves with plenty of reasons to keep coming back for more. Octodad isn’t just a single-player experience either, as there’s also a co-op mode where you and several of your (soon-to-be-ex) friends take control of separate limbs and try to work with or against each other. While it’s bound to cause more than its fair share of laughs, don’t be surprised if you end up arguing with each other if (when) one of you (probably you) screws up. 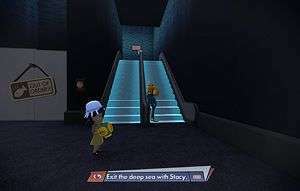 One of the more underrated aspects as to why Octodad is so hilarious comes down to its art style, which captures the cartoony premise and characters perfectly. Cut-scenes are now fully-animated rather than images conjured in MS Paint as in the freeware original, while every character has smooth animations, rather than jerky, imprecise movements. Despite being created by a small studio, Dadliest Catch often looks like a mix between a Dreamworks 3D animation and a Saturday morning CGI cartoon. It’s not the greatest looker around, but it suits the action perfectly, and you’ll find yourself falling in love with the world for the ultimately short amount of time you’ll spend within it. Although it’s clear that the developers have paid plenty of attention to how it looks, it feels like less was paid on how it sounded. The voice-acting is completely fine – although I’m not sure if the chef’s stereotypical voice borders on offensive or not – but outside of the catchy theme tune I can’t remember a single piece of music. Admittedly, I’m a massive fan of the Octodad theme and I’ve been caught singing it on more than a few occasions, but I’d have liked for there to have been at least one other track that sprang to mind whenever the game is mentioned. When I first saw Octodad: Dadliest Catch at E3, I thought it could be something special. Then when I finally got my hands on it at Gamescom and sampled the opening level, I knew it was something special. Despite being a small studio, Young Horses have created something funnier, smarter, and more entertaining than the vast majority of big-budget and AAA fare, and provides more memorable moments in two hours than most can in twenty. The asking price might seem a little steep to some considering its length, but you could equally argue it’s a steal considering the amount of pure joy it’ll deliver. It’s far from perfect, but that’s also most of its appeal; it’s a silly bit of nonsense that’s fun to play precisely because it’s hard to control, there are endless ways to screw up and, despite the fact you’re an octopus, nobody suspects a thing. Hilarious premise backed up by a surprisingly solid - if incredibly silly - story. Feels like there's always more than one way to achieve the goals set out for you, even in the stealth sections. Never feels too frustrating or annoying, despite the obtuse control scheme. Fully accommodates players who want to play with controllers, with a mouse and keyboard or with their friends. Sharply written script that manages to be funny and emotional with ease, with only one or two jokes failing to land. One of the most naturally funny games around. Constantly rewards you for experimentation and exploring the world, with achievements and collectibles as added incentives. Plenty of variety in gameplay, and never feels like it outstays it welcome or that it's too short. Wonderfully cartoony art style that sells the world of Octodad immensely. The rest of the soundtrack is unmemorable. The fact that you never truly get used to the controls might be annoying to some. Asking price might feel a bit too steep considering you can finish it within a couple of hours. 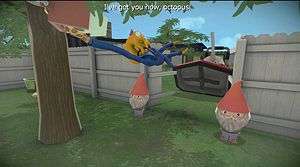 Octodad: Dadliest Catch has one of the most nonsensical premises around, intentionally wonky controls and can be finished in the time it takes to watch a film. Yet, it's one of the funniest, most inventive and charming indie titles around, and one of the most hilarious games I've ever played. Before long you'll fall in love with the unpredictable controls, a script that's both frequently amusing and emotional, and a world that dares you to try anything you want. It can be over in a blink, but there's plenty to entice you to come back, and besides, how many other games can you think of where you get to pretend to be an octopus pretending to be a human? Octodad: Dadliest Catch is slapstick in its finest form, and there's simply nothing else like it.